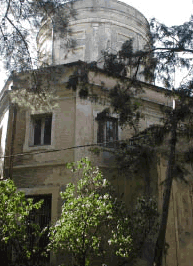 The predecessor of the State Department of Hydrometeorology of Georgia, Tbilisi physical observatory is one of the most ancient, fundamental observatories. It was founded as early as 1837, till 1844 magnetic and meteorological monitoring were conducted non-uniformly. Regular meteorological observations in Georgia originate in 1844 and have more than a 150 years’ famous history. By 1916 in Georgia were functioning about 90 meteorological stations and posts, and at the beginning of the second world war their quantity has reached 200 units. Meteorological stations were constructed also in high-mountainous, difficultly accessible places. Among them meteorological stations on Mamisoni pass (1932) and in Kazbegi are considered as the most ancient stations. Up to last period the observant network of hydrometeorological service included over 100 hydrometeorological stations and about 300 hydrometeorological and agrometeorological posts.